Since our last meaningful market correction (7% decline from mid-June to July 10, 2009), the S&P 500 has risen over 21% in less than 3 months. The best-performing industry segment over this time frame has been the Financials, which are up close to 37%. Since the market low on March 9, 2009, the Financial sector has risen close to 144% and now represents 15.4% of the S&P 500 compared to 8.9% on March 9. We have been confounded by the meteoric rise in a sector so dependent on the health of the consumer and housing market. While things have obviously improved since the dreary days of March, we see a housing market and consumer that continue to be highly dependent on a series of government initiatives designed to plug the holes in the dike. What will the picture look like when the government takes off the training wheels? Yesterday we received more data to suggest the consumer remains in hunker-down mode. Consumer credit declined by $12 billion in August to mark the seventh consecutive month of contraction. 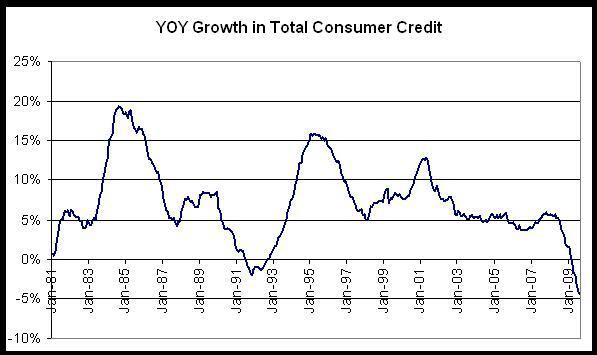 The Wall Street Journal pointed out in an article yesterday that “credit hasn’t contracted for eight months in a row since the Fed started tracking it in 1943.” Since the peak in July, 2008, consumer credit has contracted by about $119 billion, or 4.6%. This magnitude of contraction also has never been seen in the history of the United States. At the same time, we are receiving more data to suggest the housing market is by no means out of the woods. While housing sales have rebounded somewhat on a surge in foreclosure-related activity, tax credits and other government incentives, mortgage delinquencies and foreclosures continue to march steadily higher. We continue to find it hard to believe that the recent stabilization in home prices is sustainable in the face of rising unemployment, an increasing percentage of underwater mortgages, and a flood of Option-ARM resets in 2010-2011. We see it as a foregone conclusion that the government will extend or possibly increase the $8,000 tax credit for first-time buyers, but how long can the Fed keep mortgage rates artificially low as markets across the world surge in a speculative fervor? Has the global economy ever been so dependent on any one variable (US mortgage rates)? Our consistent message since the market lows in March has been that valuations are attractive for high-quality, defensive stocks. However, this rally has been, and continues to be, one led by speculators betting on 1) a quick rebound in the housing market, 2) the worst is over for the credit cycle, 3) a return to the business-as-usual consumer spending spree that got us into this mess. We disagree. We believe we are experiencing a fundamental shift in both how Americans spend and save for retirement, and how banks underwrite loans. The combined effects of the banking crisis and the loss of over $11 trillion in household net wealth have led to a sharp contraction in both the supply and demand for credit. Let us be clear: it is a long-term positive that the consumer is beginning to spend within his means and save more. However, the retrenchment we are seeing also means that economic recovery will be slow and choppy for an extended period. And the collapse in lending standards that directly led to a bubble in housing prices has yet to run its course. We continue to find value in high-quality, defensive names. 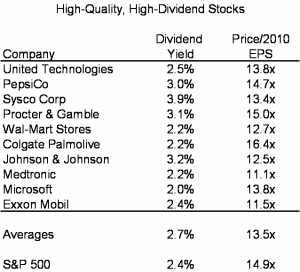 Below is a representative list of stocks that on average are cheaper and carry higher dividend yields than the overall market. In addition, these companies all have fortress balance sheets to defend against the unknown. Investors in this type of undervalued quality may stand to continue benefiting in a market looking very frothy at the moment. *These are not recommendations to buy or sell. We may be buying and or selling in portfolios under our discretionary management. If you have questions about the appropriateness of these issues for your investment strategy, please call us. On a lighter note, we are thrilled to officially report what many of you have already heard: Farr, Miller & Washington was selected as manager of a new mutual fund being offered by Touchstone Investments. The Touchstone Capital Appreciation Fund (tickers TCFAX and TCACX, depending on class) has been available for investment since October 1, 2009, and may be purchased through your Fidelity or Schwab account advisor, or directly from Touchstone by calling 1-800-638-8194. The fund will be managed using the exact same approach that enabled us to post our strong long-term track record. This is a great honor for our firm, and we hope you will consider investment with us if you have not already done so. More information is available by clicking on the link below.